Well, I hope you all had a fantastic weekend, ’cause I surely did! 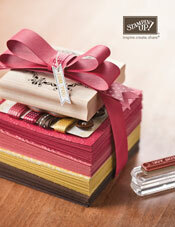 I was in stamper’s heaven … at Stampin’ Up!’s Sydney Regional training. For my swap, I used the stamp sets Boho Backgrounds and Think Happy Thoughts. 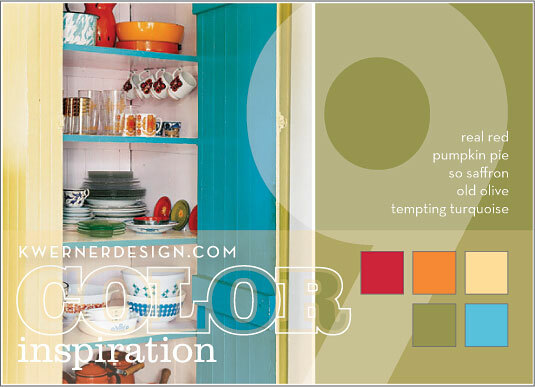 The colours are Bashful Blue, Sahara Sand and Riding Hood Red. I used LOTS of punches on the card for all the circles. Plus, I used the masking technique for the flowers down the side. Naturally, there has to be a little bit of bling SOMEWHERE on my cards, and this card had two rhinestone brads. We made these with the stamp set Hello Again and the wheel Retro Remix, both new and upcoming in the Summer Mini Catalogue (beginning 1 December – yeah!). As part of the cost of the day, each attendee received a brand new Hello Again and Retro Remix … and a new handle and a new Old Olive ink cartridge for our handle. I was pretty stoked! Stampin’ Up! is so generous, honest! And did you see the beautiful ribbons we used on our projects? They are stunning IRL! Only 4 days left … including today! It is hard to believe that we are almost at the end of February … but there are only 4 days of February left and that means only 4 days left of Sale-a-Bration! 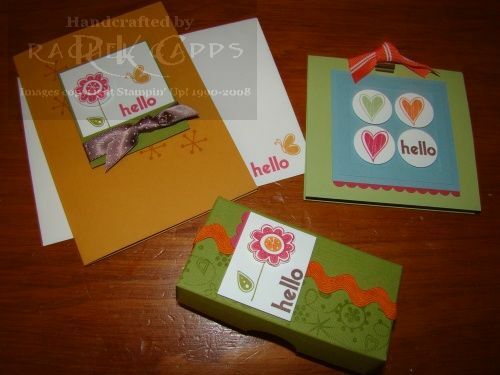 Are you often wondering what you could make with a particular stamp set? Well, this is one idea of what you could do with the Sale-a-Bration stamp set, Congrats. I’ve made this card into a card for my sister-in-law for her graduation. I’ve also used Boho Backgrounds for the handbags and have embossed them using Versamark and Wild Wasabi. 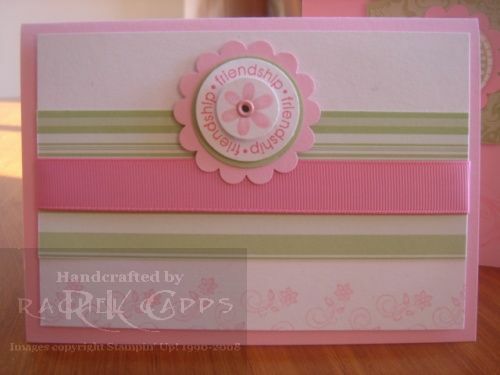 Such a simple card … and made so much easier with Stampin’ Up!’s square punches. I also paper pierced the dots under the word “congratulations”. 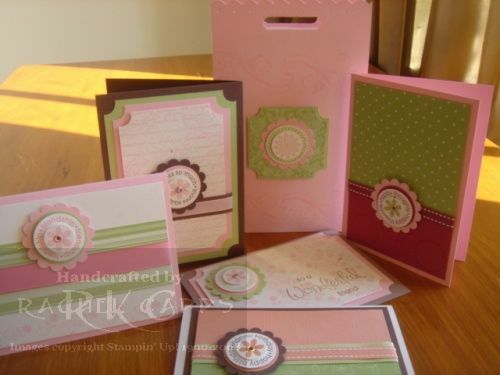 Come visit again tomorrow and I’ll post some more ideas for another Sale-a-bration stamp set. If you don’t have any Sale-a-bration stamp sets yet, then you’ll need to place an order with me of $100 or more before the end of the month to pick your own! My guest artist this week is one of the lovely girls I work with, Brie. How would you like to receive an invitation for High Afternoon Tea and for the rest of a Hen’s night/weekend looking like this? It’s pretty special, isn’t it? Brie is a bridesmaid in August and for her bride she made these lovely invitations for the bride’s Hen’s weekend. I’m sure you will all agree, Brie has done a fantastic job! If you are wondering about how to recreate an invitation like this, well Brie used Pretty in Pink and Old Olive cardstock with the matching Old Olive wide grosgrain ribbon. 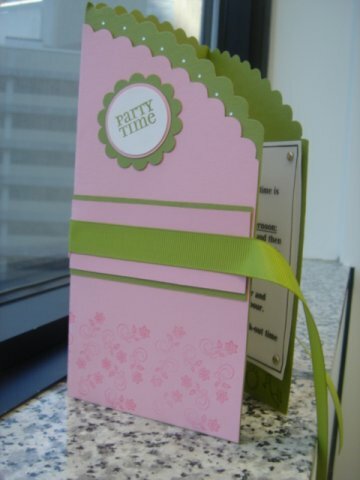 She stamped the images using Boho Backgrounds and “Party Time” from a Sale-a-Bration stamp set. There were also a lot of punches used and lots of punching, wasn’t there Brie!? 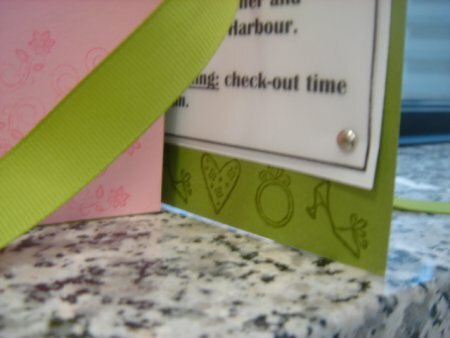 Brie started with the corner rounder punch and used it to create the edge at the top of the invite … and for a short while had her boyfriend convinced she had used the corner rounder punch to create the scalloped circle around “Party Time” … until he noticed the scallop circle punch !! LOL!! My apologies for the below photo, it’s a bit blurry. 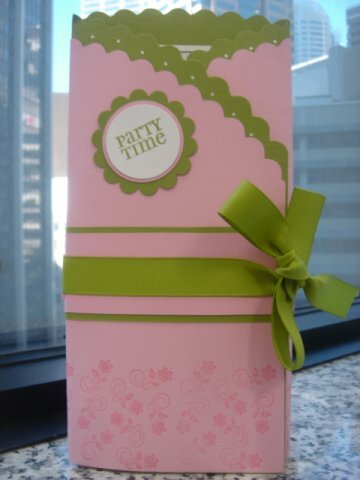 I had to share though how Brie used the All Year Fun stamp set on the bottom inside of the invites … very clever! 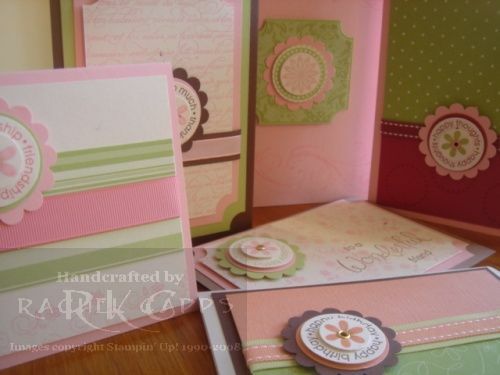 Well done, Brie, it was a great achievement to make all these invitations … and it was Brie’s first time at cardmaking! This is the Bag-a-lope we made at my eScape night last night. 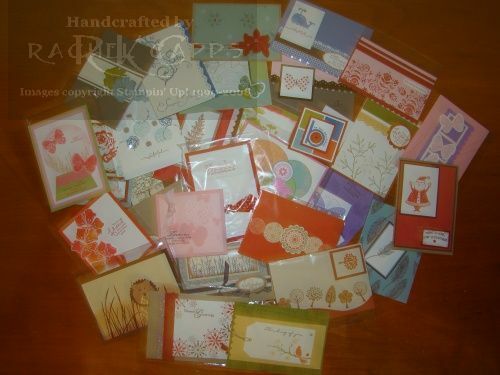 It is amazing what you can do with a some card stock, a few stamps and an envelope, isn’t it? 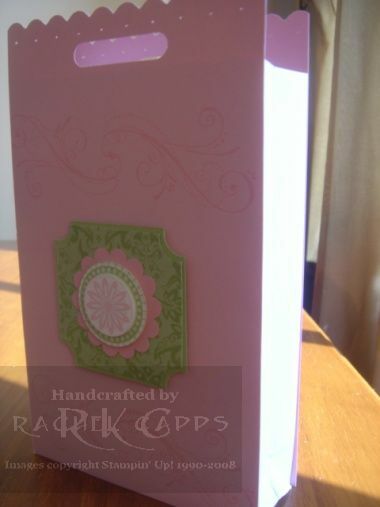 We used Pretty in Pink card stock and stamped with Pretty in Pink ink Stampin’ Up!’s Priceless swirly stamp (it’s gorgeous, isn’t it?). 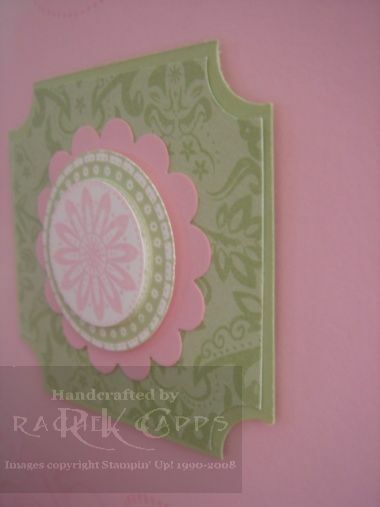 Then we stamped Boho Backgrounds twice, once in Pretty in Pink and once in Certainly Celery on Whisper White card stock. Of course, except for the top of the bag. 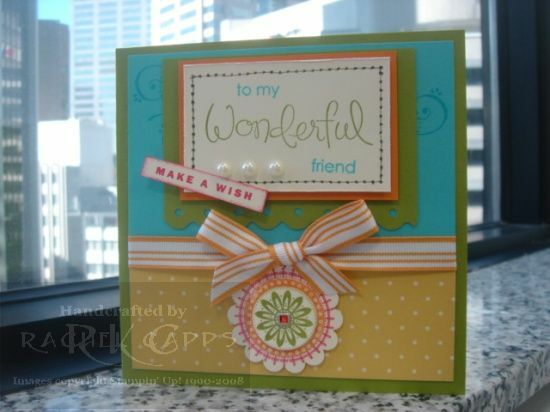 We used the corner rounder punch for the scalloped effect and then the word window punch (yes! that’s right!) to make the handle. Pretty cool punching, heh! And what a great bag-a-lope you can use for a gift bag and coordinate with your card. 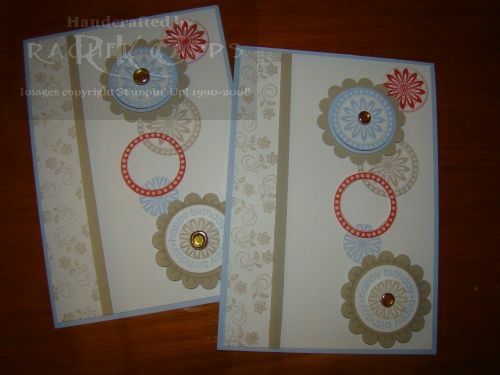 If you would like to order any punches, they are a great tool and make card making a breeze! Contact me today to order your new punch. Have a great day! I’m sorry it’s taken me so long to show you all what is happening for my eScape Event this coming Wednesday 25 June 2008. Here is is though! We will be making 5 different cards and a Bag-a-lope that will fit them all for you to take them home in. All for the great price of $20. I love this stamp set! 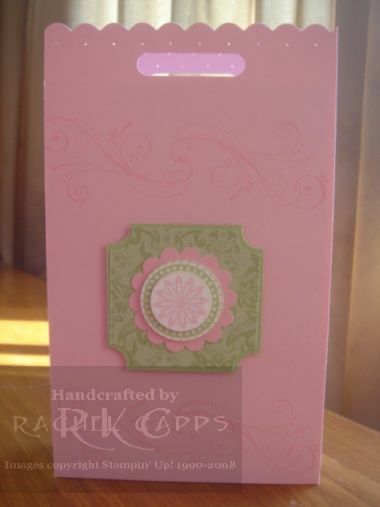 Think Happy Thoughts works perfectly with Stampin’ Up! punches. Too much fun!